00:55:00 Makes 6 servings, 1 stuffed chicken breast each. Makes 6 servings, 1 stuffed chicken breast each. This one-pan chicken and veggie bake is a weeknight winner. Crispy coated chicken is filled with savoury stuffing and baked with a medley of squash, carrots, onions, zucchini and peppers. Dinner is served! Preheat oven to 400°F. Add water to stuffing mix; stir just until moistened. Place 2 chicken breasts in large freezer-weight resealable plastic bag. Pound chicken with the side of a heavy can, rolling pin or meat mallet until chicken is 1/4-inch thick. Repeat with remaining 4 chicken breasts, adding to bag two at a time. Place chicken, top-sides down, on large cutting board; spread evenly with stuffing mixture. Starting at one of the short ends, tightly roll up each chicken breast. 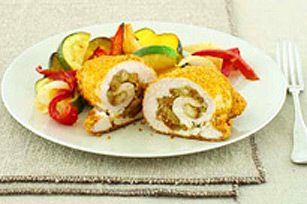 Moisten chicken with water; roll in coating mix until evenly coated on all sides. Place, seam-sides down, in large foil-lined shallow baking pan. Combine vegetables in large bowl. Add dressing; toss to coat. Add to baking sheet along with the chicken. Bake 40 min. or until chicken is cooked through (170°F). Prepare as directed, using your favourite flavour of Shake'N Bake Coating Mix. Serving Size Makes 6 servings, 1 stuffed chicken breast each.